Bowling lanes can be made of wood, wood with overlays or synthetic material. All lanes require oil to be applied to a portion of the lane to protect the lane surface from the friction of the bowling ball. The length of the oil will vary, but most centers will oil approximately two-thirds of the lane with the end of the lane left dry (no oil). 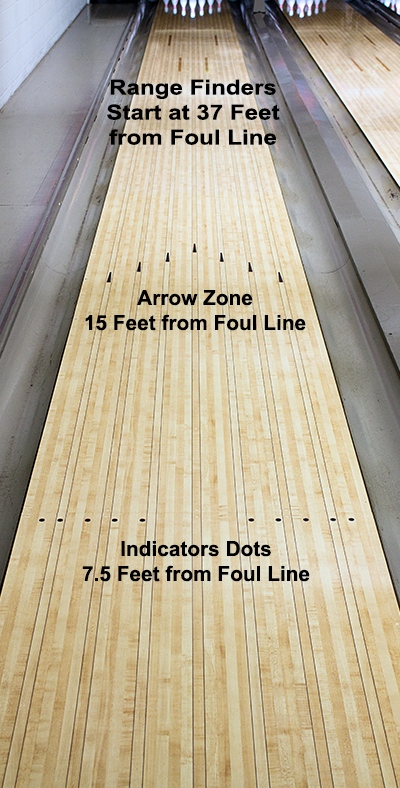 All lanes are 60 feet long from the foul line to the center of the headpin. Bowling lanes were originally made of maple and pine wood. The front part of the lanes and back part of the lane are made of hard maple and the middle part of the lane uses the softer pine wood. It is easy to see where the lane goes from maple to pine, because the boards are spliced together. Wood lanes require maintenance every one or two years depending on how busy the bowling center is. Although wood lanes are no longer made, you may still see wood lanes in some bowling centers today. Some wood lanes have a clear overlay over the surface of the lane to protect and extend the life of the wood lane and decrease maintenance. It most cases the overlay only covers a portion of the lane where it takes the most wear and tear from the bowling ball. All new lanes today are made of a synthetic material. The synthetic material is a much harder surface and has an image that makes it look like wood lanes. Synthetic lanes are made by different manufactures and can have slight variations in hardness, but all are much harder than wood lanes. The lane surface itself does not require any maintenance other than cleaning and applying oil. All modern lanes are made of 39 boards and have markings on the lane to aid the bowler in targeting. The first set of markings are indicator dots found 7.5 feet from the foul line. The second set of markings are arrows that are 15 feet from the foul line. Some synthetic lanes have a third set of markings called range finders. Range finders start at 34 feet from the foul line and end at 43 feet. Each range finder is 3 feet long. The range finders are used for bowlers that roll a hook ball to determine where the balls changes direction before entering the pins.